Nik Freitas and Whispertown will open at Cafe Du Nord on 1/17, & Greg Farley and Brad Armstrong will open 1/19 at the Bell House. Tickets on sale now. Azure Ray will perform a surprise, stripped down set tomorrow night at Pico Union Project. Tickets are SOLD OUT. Maria & Orenda will play solo sets and Azure Songs Dec. 13 at the Moroccan Lounge. 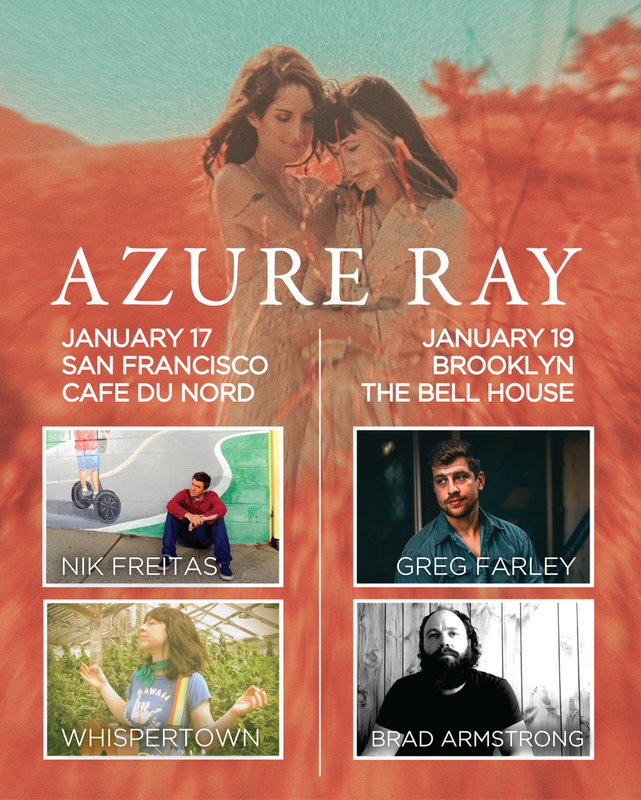 Azure Ray returns to San Francisco and Brooklyn this January. Tickets on sale Nov 16. AZURE RAY ‘WAVES’ EP OUT TODAY! Happy release day to Azure Ray! Waves is available on streaming services worldwide and a limited number of 7’ are still available from Flower Moon Records here. Thank you Omaha! Tonight’s reunion show at the Bemis Center is officially sold out! From KCRW: “It’s been a minute – well actually six years – since we’ve gotten new music from the lovely collaboration of Maria Taylor and Orenda Fink, known as Azure Ray. We’re beyond excited to offer you the first glimpse of that new EP as we premiere the video for the hauntingly beautiful “Last Summer In Omaha.” Read more here from KCRW and watch it here! From Billboard: “They've already shared the cheeky "Palindrome" video, and today you can check out their reimagination of 2003's “Hold On Love”… “For the 15th anniversary of our record Hold on Love we re-imagined the title track with the help of Louis Schefano and Maria’s father and brother, Macey Sr and Jr,” the duo tells Billboard. “It reflects the live version that we came to love playing through the years.” Listen here. “Azure Ray is back. The dream pop duo comprised of Maria Taylor and Orenda Fink is set to release its first music since 2012 with its new Waves EP, due Oct. 26. Its lead track arrives below with a cheekily irreverent music video…” Watch at Billboard. 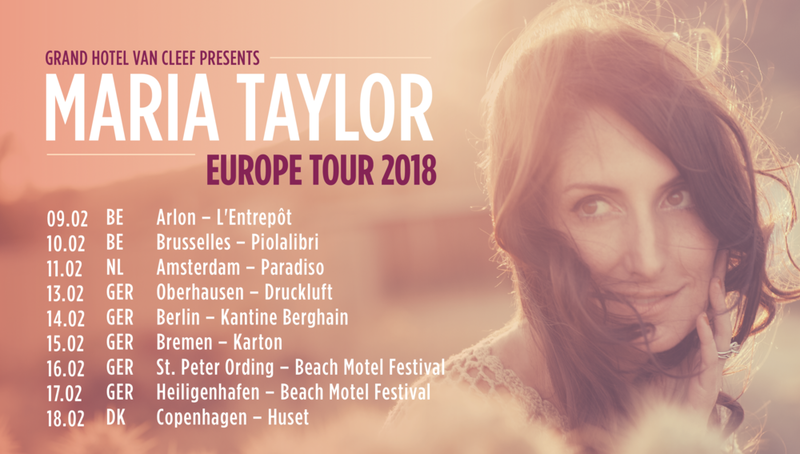 Nearly 2 years to the date of her last LA show celebrating the release of In the Next Life, Maria Taylor will headline LA’s Moroccan Lounge. Tix on sale Friday Oct 5 here. For the first time since 2009, Azure Ray will return to Omaha, NE for a concert benefiting the Bemis Center. Tix available now here. SoCalifornia! 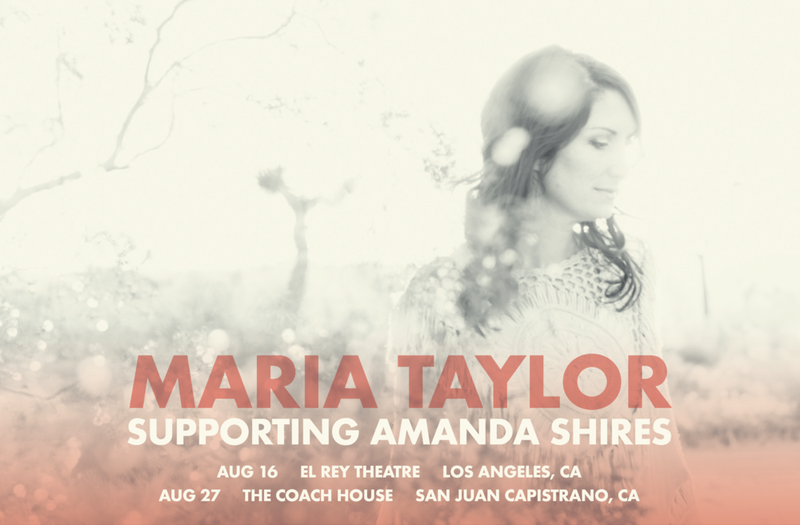 Maria is headed your way this August opening for Amanda Shires. Catch her in Los Angeles and San Juan Capistrano on August 16th and 27th. The video for "Never Felt Young" (from the forthcoming Flower Moon Records "Friends and Family Volume 1" compilation) was shot by Maria Taylor and premiered today on Culture Collide. Watch it here. Maria and friends will celebrate the release of the new Flower Moon Records compilation May 8th at Resident in Los Angeles. Event info here. Maria's new single "Real Life (Trump Era)" ft. Lester Nuby III and Louis Schefano premiered today on Paste. The song is part of a 16 track compilation released on her label Flower Moon Records. Stream the track HERE and pre-order the compilation HERE. Maria announced a handful of dates in Europe this February. More info available at Grand Hotel van Cleef's website here. Maria Taylor and long-time collaborator Louis Schefano released a new holiday song today, "Light of the World." KCRW has the exclusive premiere here. After a 5 year hiatus, Maria and Orenda are reuniting to play the Lodge Room in Los Angeles, CA on January 20, 2018. Tickets available from sidthecat.com Friday November 17th. MARIA APPEARS WITH DANIEL JOHNSTON TODAY! Maria Taylor joins Ben Lee, Mike Watt, Lucuis and more as Daniel Johnston's backing band on KCRW and for his final Los Angeles show at the Orpheum tonight. HAPPY BIRTHDAY "SOMETHING ABOUT KNOWING"
"Something About Knowing" was released 4 years ago today. Available from Saddle Creek here. Flower Moon Records launched one year ago today... and today our debut self-titled release featuring the songs "Sleep" and "Rise" , as well as Burn & Shiver, are now available exclusively through Flower Moon Records! The soundtrack for NBC's Emmy winning drama, "This is Us" is out today featuring Maria Taylor's "If Only" and other greats including Paul Simon, Ringo Starr, Stevie Wonder, Cat Stevens and more. Available on all digital streaming services here as well as a Target exclusive bundle. Check out Vol. 3 of Maria Taylor's #MariaTaylorPJseries featuring an acoustic version of "If Only" here. Daniel Johnston added two new shows to his farewell tour, including a stop in Los Angeles at The Orpheum, with an all-star backing band that includes Maria Taylor, Ben Lee, Mike Watt and more. Tickets on sale Friday. Watch Maria Taylor perform "Birmingham, 1982" live from her bedroom, in Vol. 2 of her #mariataylorpjseries here. Join Maria Taylor for an intimate performance and wine tasting at Mission Wines in South Pasadena, CA on July 22nd at 5PM. Acqua Vitasnella's new ad campaign features "Song Beneath the Song" in their commercials running throughout Italy! Maria reflects on her past, present and future in this exclusive interview Paste Magazine. Watch the video for "Just Once" and read the full interview here. Maria will play a string of dates throughout Germany this February. Tickets available through Grand Hotel van Cleef at http://www.ghvc-shop.de/detail/maria-taylor-tickets. Taylor announced she will play Rockwood Music Hall on February 11th. Buy tickets here. The sixth solo album from Maria Taylor, "In the Next Life" is out NOW only on Flower Moon Records, iTunes and at your local independent music store. NPR First Listen: Maria Taylor "In the Next Life"
"The Azure Ray singer fills her warm, reflective new album with gorgeous, touching songs about family, legacy and the pursuit of contentment." Stream "In the Next Life." "If Only" featured on "This Is Us"
"If Only," from Maria's forthcoming full length "In the Next Life" was featured during the closing scenes of NBC's hit fall drama, "This is Us." Watch the clip above. Billboard Exclusive Premiere: Maria Taylor Debuts 'If Only' Video Featuring Conor Oberst. "Singer/songwriter Maria Taylor reflects on her life in the dream-like video for the song “If Only,” which she premiered exclusively with Billboard." Read more. "Some say life is full of second chances. Maria Taylor’s new track “If Only” is a testament to that ole cliché. The first single from her approaching album In The Next Life, it’s an acoustic reverie coupled with delicate string arrangements and lighthearted percussive adornments." Read more. Trailer for the new Maria Taylor album, "In the Next Life," out Dec. 9, 2016 on Flower Moon Records (US) and Grand Hotel van Cleef (Europe). Featuring appearances by Joshua Radin, Conor Oberst, Macey Taylor, Nik Freitas, Jake Bellows, Morgan Nagler, Louis Schefano and more. Video by Dwyer PR. Maria Taylor announces new album "In the Next Life"
In the Next Life, is her 6th solo effort, and her first release on her own label, Flower Moon Records out December 9th, 2016. Appearances on "In the Next Life" include: Conor Oberst (Bright Eyes), Joshua Radin, Nik Freitas (Conor Oberst and the Mystic Valley Band), Macey Taylor (Bright Eyes, Conor Oberst and the Mystic Valley Band, Jenny Lewis, AA Bondy), Jake Bellows (Neva Dinova), Louis Schefano (Cheshires, ex-Remy Zero), Morgan Nagler (Whispertown), and Tiffany Osborn. Electrobeats and electric guitars flavor the arrangements, but the songs retain their essential country-folk character. Memorable vocal melodies and involving harmonies define the songs, whether they’re homespun (“Folk Song Melody”), gently trippy (“Sum of Our Lives”) or exuberantly communal (“Tunnel Vision”). Read more. Singer/songwriter Maria Taylor certainly has no shortage of creativity. In addition to her work as one half of dream-pop duo Azure Ray, the prolific songstress has five solo albums under her belt and lent vocals to eight Bright Eyes records. Taylor took us inside her home studio to play “Folk Song Melody,” the lead track off of her new album Something About Knowing. Check out the video below. Read more. Maria Taylor made her mark as half of Azure Ray and continues to produce great solo work. Listen here. Paste Premiere: Maria Taylor "Up All Night"
Maybe it’s because Taylor is back in Alabama, or maybe it’s because she’s surrounded herself with simpatico musicians, or maybe moving cross-country has given her something new and urgent to write and sing about. Whatever the case, Overlook is her best, most animated collection in years.